Today is the first of October and the start of Breast Cancer Awareness Month. Breast cancer touches everyone these days – whether it’s yourself, a mother, a cousin or a friend – it’s so important to spread the message to get regular check-ups. Support the cause this month by spreading the message. My friend Audrey from Mom Generations is a part of a campaign with Estee Lauder in their 2010 Breast Cancer Awareness Ad Campaign. She posed for a beautiful picture with her mother and sister to support this cause. 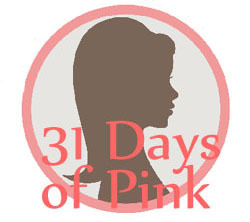 She also had fabulous idea – 31 days of wearing pink. She recuited myself and blogging friends Colleen from Classy Mommy and Vera from I’m Not Obsessed. Every day in the month of October, each of us will be wearing some pink item. Every day. I’m excited to be a part of something so important. And in such a simple way! Join me! I’m going to try and post my pink fashion as many days as I can so be sure to come back and visit to see how I get creative with pink in my wardrobe. Post your ideas and your images if you join us in our attempt to go pink for the entire month of October. Day One - the rolled out of bed look because I'm headed to the gym this morning. Wearing: Pink tank top from B&B in Ship Bottom, New Jersey. What a great idea!! I’m in! I love pink and I love the cause. Have to see what I can come up with. Everyday? Wow. Have to get creative. I have a pink watch, pink shoes, pink earrings and a necklace with some pink beads. Going to pick up a pink ribbon or two for my hair on bad hair days. I’m set! Awesome idea! I love it!!! Love this Whitney! 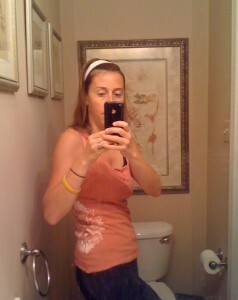 I saw it on Julie’s FB post earlier today & recruited my partner Dana to do it with me as well. We’ve posted about it on our site too & hope to help grow an amazing amount of awareness this month! Today, I wore pink underwear, just by chance. Tomorrow starts purposeful PINK for me! Whit, great idea! I think I am going to try this! If anyone wants to get some pink jewelry/accessories, Stella & Dot is going to donate 20% of our net proceeds to Breast Cancer Research on purchases of our pink styles during the month of October. I will be wearing my pink necklace with my gold cancer charm and gold “hope” charm (either tied as a bracelet or necklace) Shameless promotion, I know, but it’s for a good cause! Bridie’s Baubles has been inspired! As of today we have added fun products with the pretty pink bow! Bath wraps, carry all bags, slippers, flip flops & a pink bracelet! THE BEST PART!!!! A portion of all the proceeds for each item purchased will go to Breast Cancer Awareness! Have fun sporting PINK & GIVING BACK! I understand this can be seriously dull and you are skipping for the next comment, but I just wanted to toss you a big thanks, you cleared up some issues for me!